Metal Hanger Stackers - 33" Chrome-Plated. Holds approximately 100 hangers of average size. Helps prevent breakage and tangling. Base is 19 1/4" x 7 1/2". PIPE-INSPIRED DESIGN: Durable metal clothing bar designed to look like an industrial pipe. CONVENIENT GARMENT STORAGE: Easily installed rack adds nearly 20 inches of clothes-hanging space. VERSATILE RETAIL DISPLAY: Can be used to display necklaces, scarves, or neckties in retail settings. The Black Single-Rail Collapsible Salesman Rack is a great solution for temporarily overstocked items. Whether you are using them for seasonal items, clearance sales, or keeping your stock room organized, the rolling racks get the job done. They fold up flat, so they can easily be stored away, and they can easily be set up when needed for use. Measuring 48"W x 24"D x 56-66"H, these rolling clothing racks are the perfect size for hanging garments. Featuring 4'' industrial casters, the clothes racks are completely reliable regardless of where you're wheeling it. It's easily stored and there's no assembly required. Overall weight capacity is 250 lbs on this EZ fold clothing rack. Econoco s ballet rack is the perfect addition for your clothing store display! Ideal for showrooms and warehouses, this ballet rack is constructed of heavy-duty 1 diameter plumbing pipe for a classic look to complement your store and products. 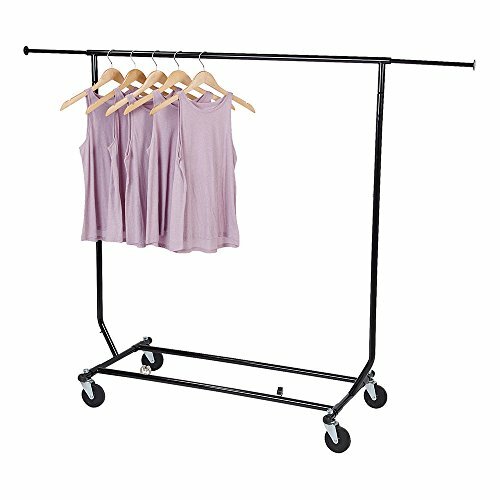 With a base that measures 51 Wx22 D and a height of 64 , this rolling rack lets you display clothes securely, efficiently, and in a manner that is sure to catch the customer s eye. You wouldn t put the Mona Lisa in a low-quality frame, and you shouldn t showcase your products on a clunky, ugly garment rack. With an anthracite grey finish, the rack is sleek and stylish, but not enough to compete with your merchandise. HEAVY DUTY - This ballet rack measures 64"H and 51"Wx22"D at the base. It is constructed of heavy-duty 1 " diameter plumbing pipe. EASY TO ASSEMBLE - Make it once, make it right, and never worry about its construction again with easy-to-follow instructions. VINTAGE DESIGN - The classic industrial pipeline look adds to the atmosphere of your store. 4 CASTERS - This portable wardrobe hanger includes four 2 casters: 2 locking, 2 non-locking. 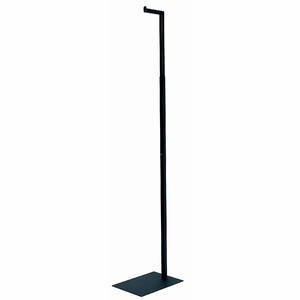 ADD TO DISPLAY - With an anthracite grey finish, this clothing rack is sleek and stylish, attracting customers without distracting from the coats, shirts, and other garments you hang on the pole. 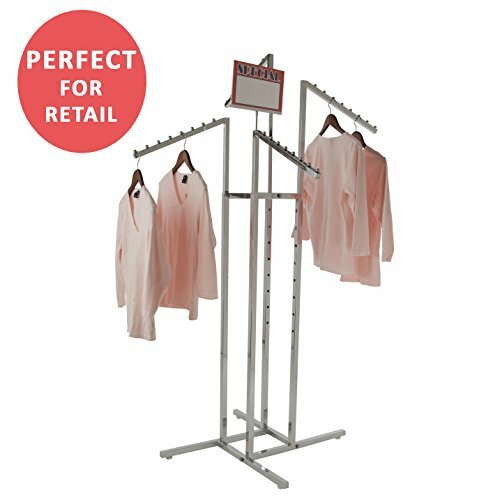 Econoco s 4 arm clothing rack is the premiere clothing rack for store display! This fixture for clothing has 4 straight blade arms. This allows for any store to place their clothing on this clothing store display rack any way that best fits their needs. With the arm height being adjustable on this clothing rack it allows the customer to put the arm anywhere from 48 to 72 with 3 increments. Not only does this 4-arm clothing rack have adjustable arms but it is chrome plated for the ultimate showroom look. With this Black Matte 4-way clothing rack it adds to the ambiance of any store or boutique that you choose to place this clothing rack. With the clothing rack weighing 34 pounds you can rest assured no matter where you place this clothing rack that it will stay put where it is meant to. With this clothing store rack having four arms you can easily place a dozen items of clothing on this rack, and have it displayed and readjusted to whatever needs fit your store the best! 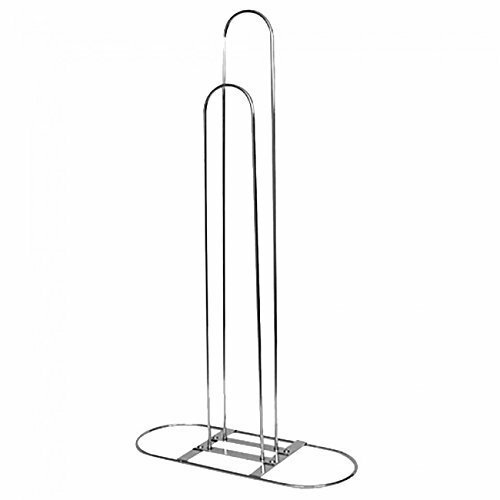 CHROME CLOTHING RACK: Econoco's premium Black metal clothing rack is perfect for any clothing store display. The simple sleek look of the Black Matte finish and blade arms will allow all clothing showcased on this clothing store display will be the centerpiece of the store. ADJUSTABLE: On this 4-way clothing rack there are 4 straight blade arms 16 length arms adjustable every 3 from 48 to 72. All the arms on this clothing store rack are adjustable allowing you to accommodate the arms to the best fit for all clothing. DURABLE & STURDY: With this store front display coming in at 34 pounds it will stay put no matter where you decide to place your clothing rack. This clothing rack was made for retail, so once you pick a spot it will stay exactly there. 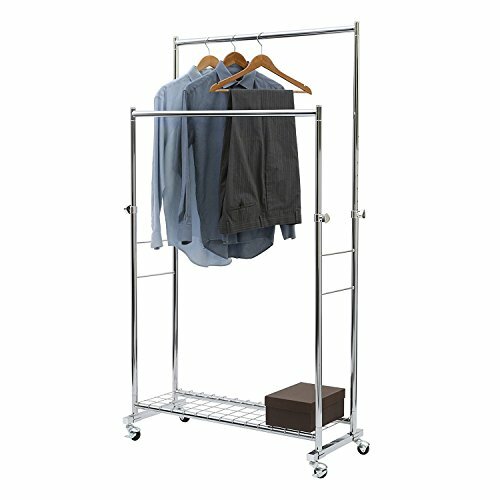 STORAGE: This clothing rack is the perfect retail addition if you are looking for something on the more compact side. Seeing as this clothing store display takes up only 32 inches of floor space. UNIQUE: With 4 straight arms on this fixture for a clothing store it gives the clothes you hang on them easier visibility and a more unique look. It gives any store or boutique owner the ability to properly showcase their clothing in a fashionable way on this 4 arm rack. INSTRUCTIONS INCLUDED IN EMAIL UPON PURCHASE. If you need both slant arm racks and straight arm racks you've come to the right place. 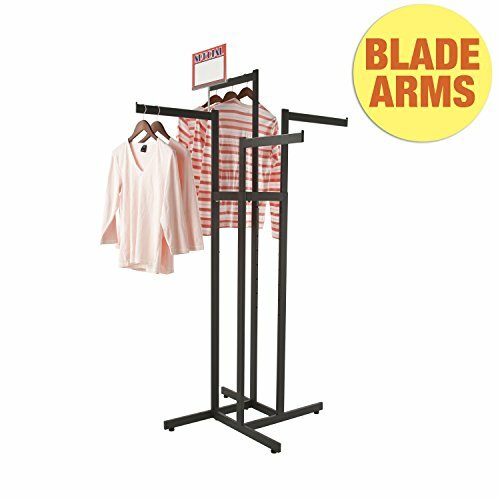 Now you can display merchandise on straight and slanted arms with our Black 2-Way Garment Racks with 1 Straight Arm &; 1 Slant Arm! Whether you re showing available colors entire outfits or completely different styles showcase available merchandise on the slant arm for all of your customers to see. Then host the available options on the straight arm for this clothing rack behind it. 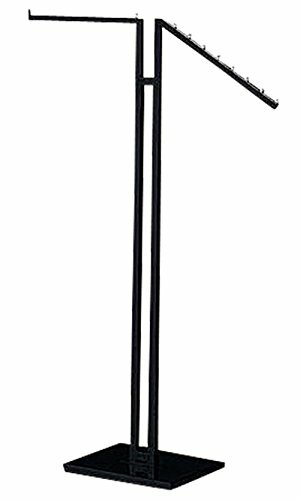 This 2-way clothing rack is available in black finish to match any store display fixtures. 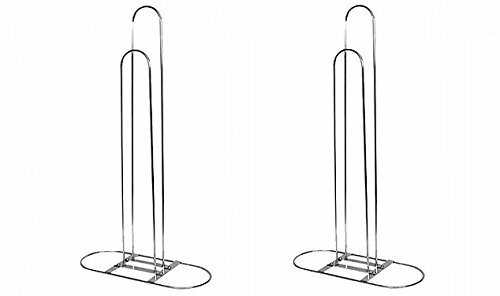 Additionally these clothing racks feature welded end caps and adjustable leveler glides. Maximize floor space and add a chic element to your showroom display with our Black 2-Way Clothes Rack! Height: 48 (min) - 72 (max) Color: Black Matte. Instructions are included in an email upon purchase. Econoco s spiral rack costumer is the perfect addition for any retail setting! Measuring 67 high and with a sturdy 18 diameter weighted base, this costumer is a stylish and practical way to attract customers. Whether it s for your latest fashions or for clearance items, hang them all up on the right rack for a little added luster to your retail environment. 29 GARMENTS - This spiral store fixture lets you highlight up to 29 individual pieces, from purses to tshirts to bags and other accessories and pieces of clothing. 360 DEGREES - Keep your supply looking fly from any angle! The spiral design allows pieces to be viewed from 360 degrees in your store. 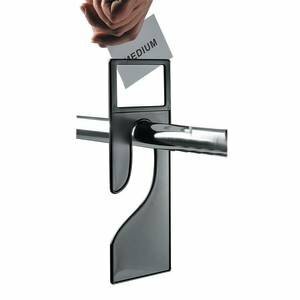 CHROME FINISH - The chrome finish keeps this attractive clothing rack from being an ugly eyesore, helping to draw customers' attention, not drive them away. CAN ADD SIGN - The ability to attach a sign at the top lets you draw more attention to the products on the rack. HEAVY DUTY - High-quality materials and a heavy base provide more than sufficient stability for even heavier apparel. Cost effective and stylish way to showcase apparel. Adjusts from 49 inch to 78 inch (H) to easily present various length garments. Made of 1 inch square steel tubing and has a weighted base for a strong stable display. Product type: Hanger. Manufactured in China. Econoco s 4 way hand bag rack is the premiere store bag rack for your store display! This handbag hook display has a total of 8 slant arms with 5 hooks on each arm. This allows for any store to place their handbags or small garments on this display rack any way that best fits their needs. Includes four (4) twist-on arms with hooks to create two tiers. Slant Arms are 18" long. Each arm is independently adjustable every 3" from 48" to 72". Not only does this 4-way rack have adjustable arms but it is chrome plated for the ultimate showroom look. With this chrome 4-way rack it adds to the ambiance of any store or boutique that you choose to place this handbag rack. With the hand bag rack weighing 35 pounds you can rest assured no matter where you place this handbag rack that it will stay put where it is meant to. With this handbag display rack having eight arms you can easily place a dozen handbags or small garments on this rack, and have it displayed and readjusted to whatever needs fit your store the best! 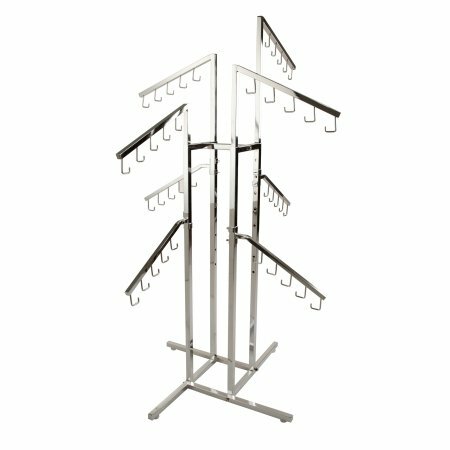 CHROME CLOTHING RACK: Econoco's premium Heavy-Duty chrome metal handbag rack is perfect for any clothing store display. The simple sleek look of the chrome finish will allow all handbags showcased on this handbag display will be the centerpiece of the store. ADJUSTABLE: On this 4-way handbag rack there are 8 arms with 5 hooks on each arm each 18 in length. Each arm is independently adjustable every 3 from 48 to 72. DURABLE & STURDY: With this store front display coming in at 30 pounds it will stay put no matter where you decide to place your handbag rack. This display rack was made for retail, so once you pick a spot it will stay exactly there. STORAGE: This display rack for bags is the perfect retail addition if you are looking for something on the more compact side. Seeing as this handbag display takes up only 32 inches of floor space. UNIQUE: With 4 twist-on arms with hooks to create two tiers on this hand bag display it gives the handbags you hang on them easier visibility and a more unique look. It gives any store or boutique owner the ability to properly showcase their handbags or small garments in a fashionable way on this 4 way garment rack. Heavy Duty Z-Trucks are single-rail salesman clothing racks designed as the perfect solution for stockrooms, restocking, overflow, sales, and specials. 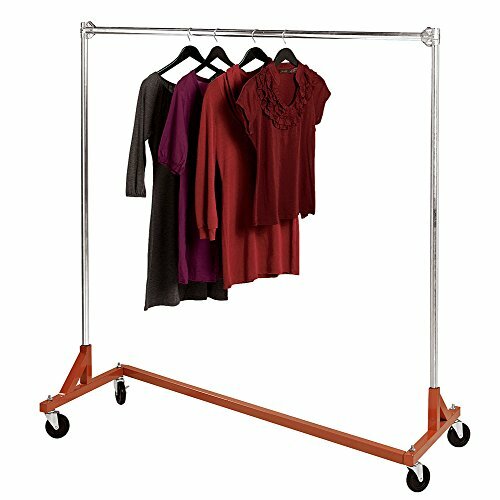 Featuring an orange base for safety purposes, the Z-Truck Heavy Duty Clothes Racks have a 400 pound capacity. They measure 66" high x 63" wide and 24" deep, so they can hold as much overflow as possible. With an adjustable rail and 4" industrial casters, the Z-Trucks are portable, but incredibly durable. Uprights and hang bars are chrome finish while base is painted OSHA "safety-orange". 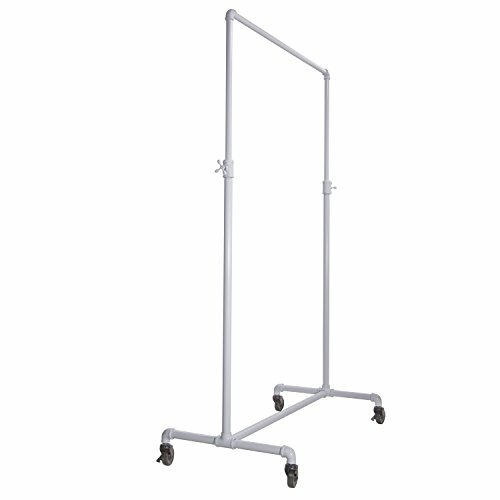 All Heavy Duty Clothing Racks are available for immediate shipping. We guarantee the lowest prices on all garment racks. Econoco s 2-way ballet rack is the perfect addition for your clothing store display! Ideal for showrooms and warehouses, this 2-way ballet rack is constructed of heavy-duty 1 diameter plumbing pipe for a classic look to complement your store and products. With a base that measures 42 W x 23 D, and with an adjustable height of 44 -72 , this rolling rack lets you display clothes securely, efficiently, and in a manner that is sure to catch the customer s eye. You wouldn t put the Mona Lisa in a low-quality frame, and you shouldn t showcase your products on a clunky, ugly, non-adjustable garment rack. With an anthracite grey finish, the rack is sleek and stylish, but not enough to compete with your merchandise. HEAVY DUTY - This 2 way ballet rack measures 42 "Wx23 "D at the base and is constructed of heavy-duty 1 " diameter plumbing pipe. 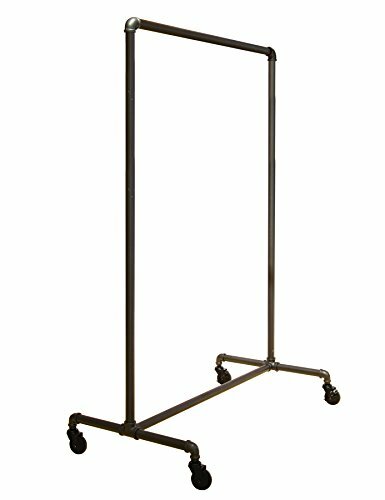 ADJUSTABLE - This free standing garment hanger adjusts from 44 to 72 in height to highlight whatever commercial garments you wish to hang on it. These rack dividers keep merchandise organized and accessible. These rack dividers fit a standard hang rail. Made of durable plastic. Adjusts from 44" - 72" in height. Base: 42-1/2"W x 23-5/8"D. Constructed of heavy duty 1 1/4" diameter plumbing pipe in gloss white finish. Includes four 3" casters, 2 locking, 2 non-locking. Seville Classics Double Commercial Garment Rack. Two height-adjustable hanging rods provide generous space for clothes hangers create room for dresses, jackets, sweaters, pants and more. Dual hanging rods provide more than 66 inches of hanging space. Designed with professional use in mind, our racks include four 2-inch casters for easy transport and industrial-strength steel construction for the stability you need. Total unit weight capacity: 145 lbs. 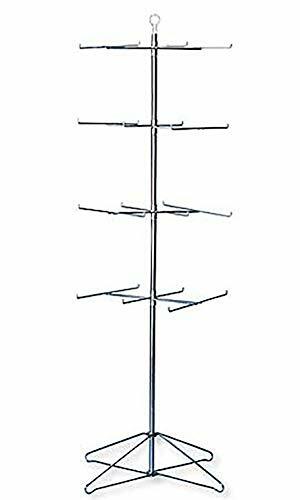 Econoco s 4 slanted arm clothing rack is the premiere clothing rack for store display! This fixture for clothing has 4 slanted arms. This allows for any store to place their clothing on this clothing store display rack any way that best fits their needs. With the arm height being adjustable on this clothing rack it allows the customer to put the arm anywhere from 48 to 72 with 3 increments. 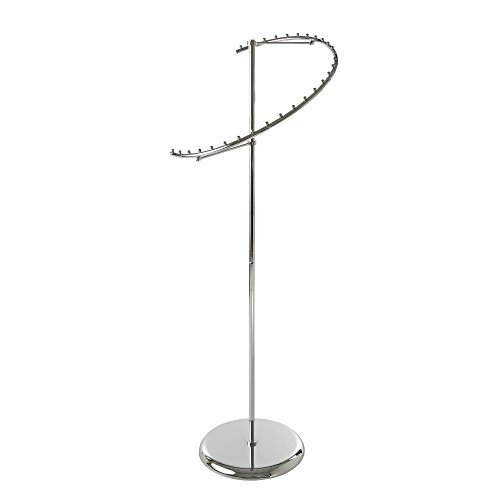 Not only does this 4-arm clothing rack have adjustable arms but it is chrome plated for the ultimate showroom look. With this clothing store display rack being chrome it adds to the ambiance of any store or boutique that you choose to place this clothing rack. With the clothing rack weighing 32 pounds you can rest assured no matter where you place this clothing rack that it will stay put where it is meant to. Comes with adjustable levelers for uneven floors so your rack stays exactly where it should no wobbling. 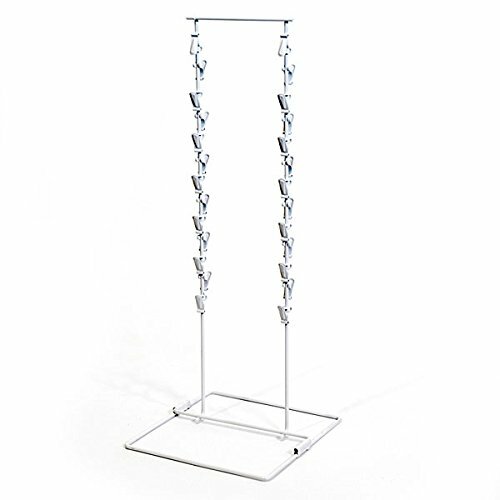 CHROME CLOTHING RACK: Econoco's premium Heavy-Duty chrome metal clothing rack is perfect for any clothing store display. The simple sleek look of the chrome finish will allow all clothing showcased on this clothing store display will be the centerpiece of the store. 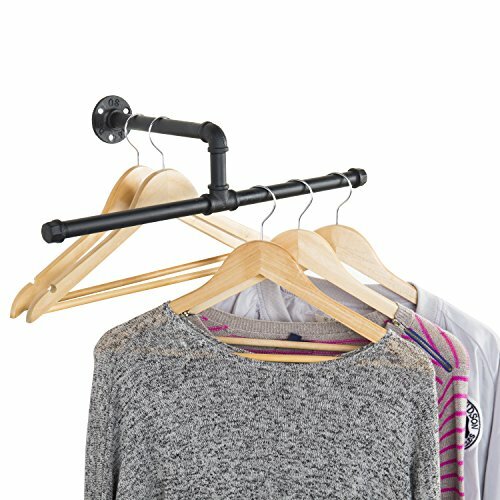 ADJUSTABLE: On this 4-way clothing rack there are 4 slanted arms 18 in length with 8 balls. Height is adjustable every 3 from 48 to 72. All the arms on this clothing store rack are adjustable allowing you to accommodate the arms to the best fit for all clothing. 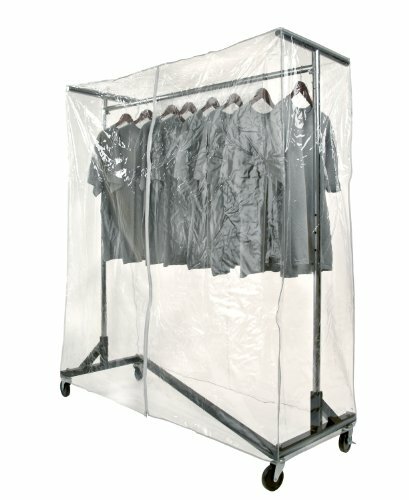 DURABLE & STURDY: With this store front display coming in at 32 pounds it will stay put no matter where you decide to place your clothing rack. This clothing rack was made for retail, so once you pick a spot it will stay exactly there. UNIQUE: With slanted arms on this fixture for a clothing store it gives the clothes you hang on them easier visibility and a more unique look. It gives any store or boutique owner the ability to properly showcase their clothing in a fashionable way on this 4 arm rack.